A year ago today I wiped my classroom chalkboard clean for the last time, and walked out into the New York City summer as a truly free woman. I had been waiting for this moment for what felt like eons. We’d been planning to leave, in some form or another, for years, and I had been imagining this moment for nearly as long. Don’t get me wrong here, I didn’t hate my job, I just knew that this part of my life was coming to an end and I was ready to move onto the next bit. Honestly, it was a little anti-climactic. Two days later we packed up the rental truck and drove what remained of our belongings back to a storage unit in Colorado, so at the time we were still in a bit of a frenzy. Before we officially set out on this journey we took 4 months to decompress in Vermont, which was a lifesaver. Living in New York City turns you into a different kind of beast, and I was ready to unwind and re-learn how to live slowly. Not working is exactly as great as it sounds. If we could do it forever, we would! At the time, there were some murmurs of worry from well-intentioned friends and family. People worried that we were leaving very stable jobs and benefits for something unknown. People worried that we would have a hard time replacing those jobs when we were finished travelling. People worried that we’d become lazy and not have the motivation to work. The thing is, those were their big worries, not necessarily ours. I’m not going to tell you we didn’t have some moments of doubt or fear along the way, or that we haven’t thought about the obstacles we may face when we return. We’ve got a plan for facing the potentially difficult job market as well as a healthy re-entry fund, and that’s all anyone can really do in our situation. There is incredible truth in that statement. Anything you want that requires change is likely to be at least a little bit scary. 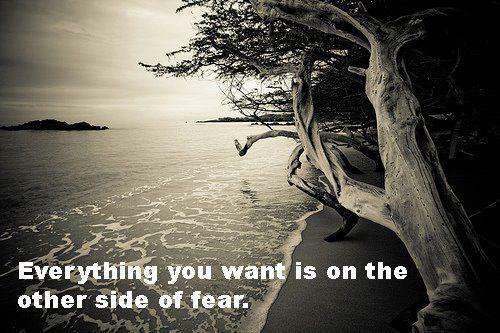 If you never confront that fear, you will never be able to make the changes. We know that there are no guarantees in this life. That’s exactly why we’ve spent every day this last year living with wild abandon even when, or perhaps especially when, it frightens us. For the first time in my life I can say that I am living my life without regret. I know that we may not ever get an opportunity like this again, and I refuse to let fear stand in the way. Can I just say I never once worried for you at all. Some people have the ability to find jobs no matter what the economy and make rain, start over, do what’s necessary no matter where they are. I think of you as a team who can do that. I think it’s great what you’re doing and believe in you all the way. Your courage to not only face the unknown but to embrace it fully is such an inspiration ! I agree wholeheartedly with your Aunt Rock…basically life is what you make of it. Go for it !!!! Yes! I have so much I want to say about this post. Will sit down a little later and write it. Just couldn’t resist a big cheer! Thanks! Hope you’re feeling better, I see you are back to running, and swimming? I love this post and I love you guys!!! Not many people have the courage to do what you are doing. Congrats!! I applaud your ability to go out and face an unknown future. I haven’t gone around the world but have had to face unknown futures several times in my life. Good for you!! I love your blog. That’s what really struck me most about the quote on the picture. Everyone has things they wish were different, or has to face the unknown at least a few times in their lives and if we can try to look past our fears when we’re in the moment then we can ultimately find our way through. Really thrilled for you guys and this amazing adventure!! Thanks! Hope all is well in NYC! What an inspiration you both are! I’ve enjoyed every minute reading about your adventure of life….your courage to face the unknown and the positive way your have completed your journey….to make your dreams become a reality is awesome….. thank you for sharing…. Well said, Ashley. Does it feel like it’s been a year? You all will have no problem finding jobs when you get back and there’s no way you two will ever be lazy. We had plenty of people thinking we’re crazy too. Thanks! It’s strange, it feels like forever, and no time at all! I can remember so vividly leaving NYC, and then leaving the USA, and now I look at where we are and just keep wondering how it’s going by so fast!